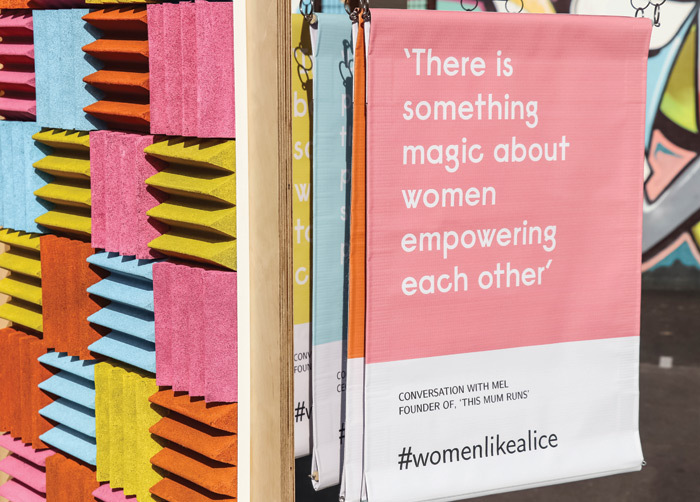 To mark 100 years of women’s suffrage, Concrete Communications collaborated with Bankside Open Spaces Trust to celebrate 10 extraordinary women local to Bankside. 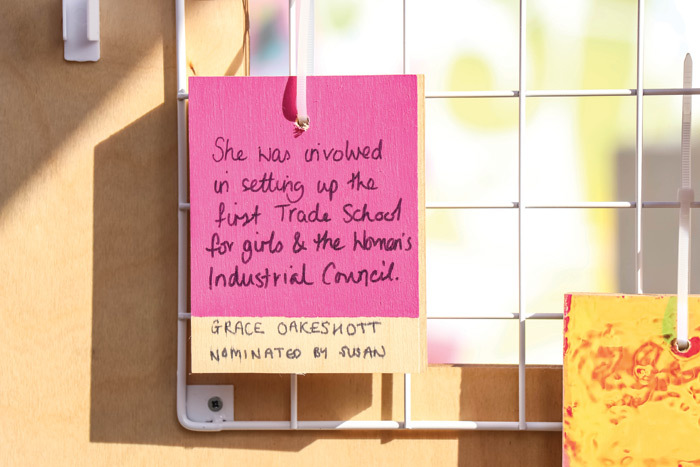 As part of London Festival of Architecture (LFA), Interpreted Identities invited London-based architects, designers and artists to create temporary public installations that celebrate women who have helped to shape SE1. Presented in the newly launched Marlborough Sports Garden, the space forms the basis of one of the follies, being a legacy project of Consuelo Vanderbilt Balsan. Born into a life of privilege, Balsan sought to use her wealth and status for good by offering her money, home and time to those that needed it. Architecture practice InsideOut has represented her life through a wall woven with ribbons, representing her gifts, woven tightly together, unravelling across the space and into the community. This creates a shelter and a play area, illustrating her work for the community. RCKa is celebrating Alice Williams, who runs Luminary, a London bakery that provides skills, training and support for disadvantaged women. RCKa hopes that its piece can both celebrate women like Alice and encourage others to make similarly meaningful contributions to their communities. Other women celebrated are Octavia Hill (Cove Burgess), PJ Harvey (FORGE Architects), James Barry (PRP Architects), Bella Burge (Aros Architects), Mary Wollstonecraft (Foundry & Bottle), Fanny Wilkinson (Stephen Kavanagh Architects), Annie Besant (One Works), and Mary Shelley (DnA Factory). The Royal Academy’s Summer Exhibition is the longest running open-submission show in the world and the RA is celebrating its 250th year by spilling out further into its public galleries and into the streets of London. New to this year’s event, curated by Grayson Perry RA and a committee of fellow Academicians, is Perry’s Room of Fun, dedicated to amusing pieces. 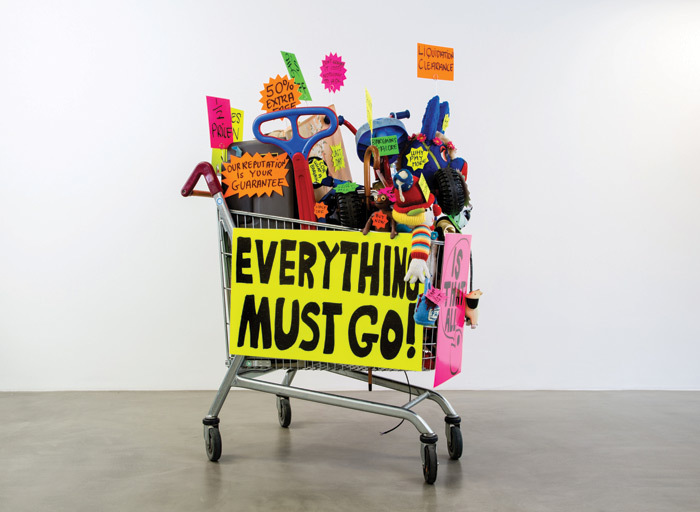 It sits in the newly built Ronald and Rita McAulay Gallery and includes Michael Landy’s Closing Down Sale and David Shrigley’s mundane but amusing Headlines. In true Perry style it is accessible, comical and lively but maintains a serious, political edge. Artists’ work will also be adorning some 200 flags in London’s West End. As a brand built on the joining of American and Japanese expertise, craftsmanship and experience, Ultrafabrics has taken its work global again, opening its first international showroom in Clerkenwell. Not content with just spanning three countries, the company’s new showroom was designed and developed by Danish interior design practice OEO Studio, in collaboration with creative strategist Teke Busk. Ultrafabrics already pushes the limits of what performance fabrics can do, it says. It creates intelligent, cruelty-free, highly functional polyurethane products and is constantly seeking to challenge the perceptions and expectations of performance fabrics. The showroom’s design takes inspiration from both nature and the Japanese design Ultrafabrics is known for. OEO Studio specialises in a Japan-meets- West design style, which it was able to utilise in the new showroom to create an adaptable space. 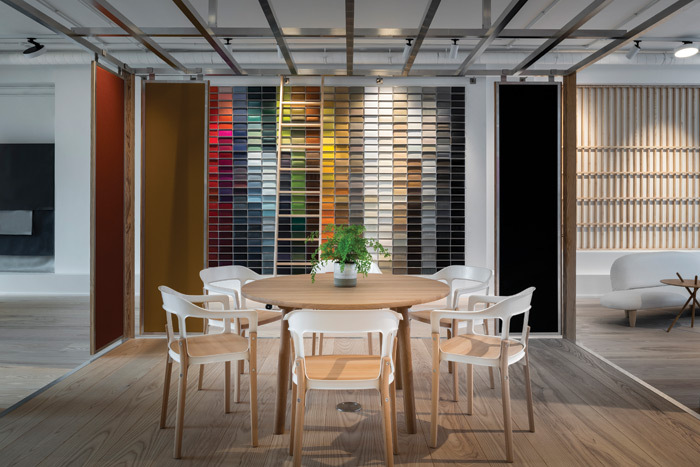 It features moveable partitions, essential in Ultrafabrics’ bid to create not just a showroom but a creative hub for the design community, both locally and internationally. A long material rack holds extra-large samples that can be examined on an adjacent table. The design is simple but functional, with each element of the space being necessary and justified. Students were invited to propose commercial furniture designs to solve issues faced by an increasingly digital and mobile workforce for the design competition Up in the Cloud, created by Verco, Perkins+Will, Collaborate and London Metropolitan University. 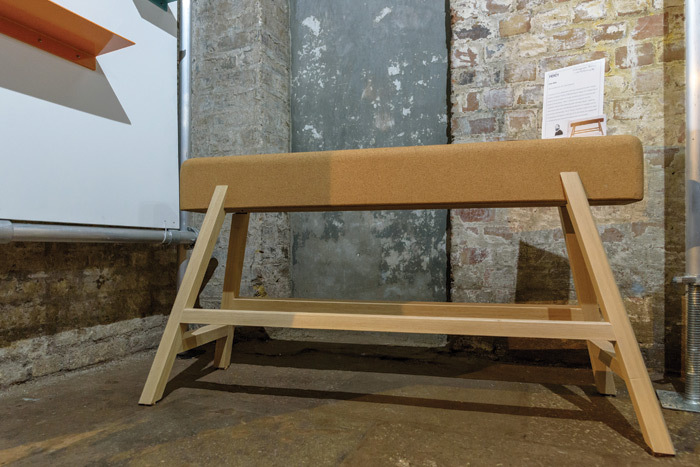 Adam Watt’s winning entry, Perch (shown left) takes inspiration from the new agile workplace with Watt’s creating a gym-inspired bench seat. Not comfortable enough to be used for long, it provides a commentary on a workplace culture that values active, nimble workers. Runners-up were Ella Merriman’s Dog-eared Shelf, with a hook for public bathrooms; and Martha Haines’ Jacobs Space, a flexible screen created by planters. Some 15m above Westminster Abbey’s floor, the medieval triforium had been hidden from the public for 700 years. 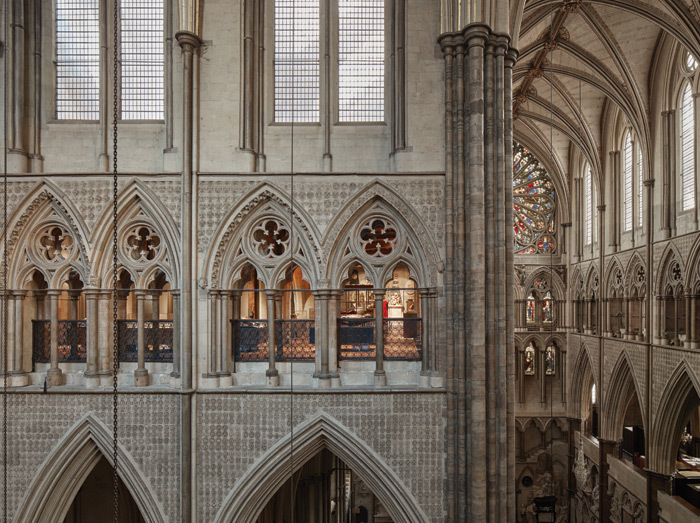 Now the gallery, revamped and transformed by architecture practice MUMA, and named the Queen’s Diamond Jubilee Galleries, has been unveiled, displaying abbey treasures and giving the public an insight into its 1,000-year history. The work on the revamped historic space has been a sensitive intervention, sympathetic to the historic building. The newly revealed space is flooded with natural daylight, ensuring the architecture and artefacts are equally on display. This was achieved in a collaboration of MUMA and engineering firm Max Fordham. MUMA’s experience in subtle architectural responses, with Max Fordham’s knowledge of daylight and environmental analysis, created a highly functional, rigorous design. The galleries will be accessed through the new Weston Tower, designed by Ptolemy Dean Architects and forming the first major addition to the Abbey since 1745. 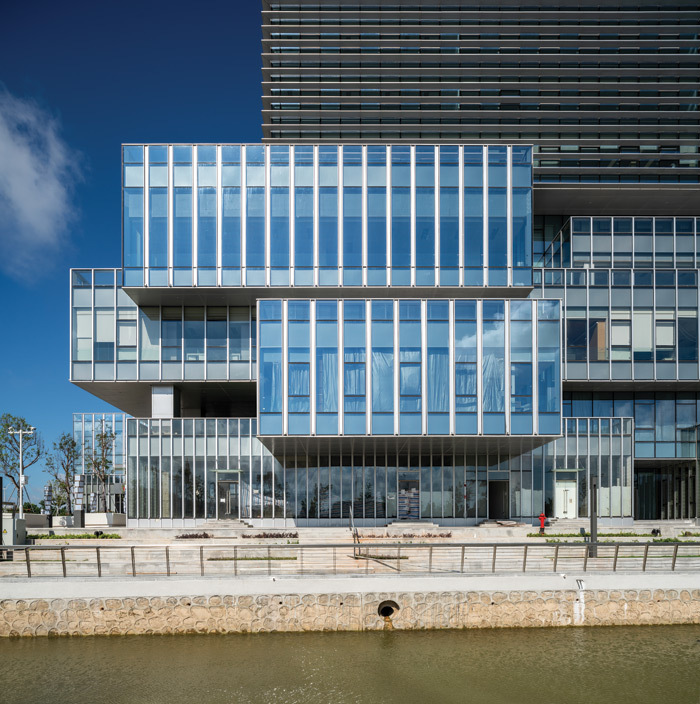 Aedas has completed the headquarters and gateway building to the Traditional Chinese Medicine Science and Technology Industrial Park in Zhuhai, China. The design is inspired by the traditional Chinese concept ‘round sky and square earth’ and uses it to highlight a harmonious relationship between the man-made structure and the natural world. The atrium features a 15-floor-high void, enabling natural daylight to flood the entrance space. The new HQ comprises leasable offices, an exhibition centre, service centre, meeting venues and amenities. One of Europe’s leading glassmaking workshops, London Glassblowing, is showcasing artists Louis Thompson and James Devereux, both part of the burgeoning glass scene in the Maldives, after a residency at the Soneva Fushi Resort there. The exhibition, Latitude, presents a selection of the work produced during their stay when they worked exclusively with recycled glass, using the five tonnes that are produced in the Maldives each month. London Glassblowing hosts Latitude until 7 July. Contemporary textiles manufacturer Kvadrat has acquired a majority share in Dutch textile company Febrik, adding an expansive knit collection to its portfolio. Febrik works across domestic and contract markets, specialising in 3D structures with vibrant and versatile colours. With a history spanning six decades, Burgess Furniture is redefining itself with the launch of a new showroom, a new website and the expansion of its management team. From beginnings in making aluminium handlebars for cycles, Burgess went on to develop the stacking banquet chair. Now its new showroom in south-west London features its new collections including the Smart Qube adaptable seating range and Junea chairs. For this year’s London Design Festival, design shops and retailers in Marylebone will open their doors to host workshops, demonstrations and launches during the week-long event. The distinctive area of Georgian architecture hopes to bring a unique character to the festival and showcase the creative talent housed in the period buildings. The festival starts on 15 September. Metsä Wood has launched a platform for its initiative Open Source Wood. Its aim is to facilitate and encourage the growth of modular wood construction by making ideas free and accessible. It gathers information on current wood construction projects globally in a bid to encourage innovation through sharing. The platform also enables users to share ideas and receive feedback from experts, and connect with others in the industry. The Urban Design Group has opened an Urban Room in Nottingham, an idea first conceived in the 2014 Farrell Review. It seeks to provide a physical space where people can go to engage with the past, present and future of their cities. In Nottingham this will be facilitated by a series of exhibitions, activities and training programmes to nurture the idea that we all have a role in urban design. Darling Associates, a practice of architects, interior architects and masterplanners, has acquired the Manchesterbased leisure and hospitality firm, Architect-CT, which will continue to trade as Architect-CT until later in the year. Gemini Tiles is exploring geometric patterns in home interiors with the introduction of its new Cuban collection, featuring six tiles. As opposed to creating patterns using glazes, they are inspired by encaustic tiles, that is making patterns using different colours of clay. The collection uses a monochromatic palette to enable a pared-back look and let the detail in the pattern come to the fore. Swindon Borough Council has approved SMG’s plans to build a collection management facility in Wroughton, Swindon. The application, submitted on SMG’s behalf by Pegasus Group, is for a space to store, research and prepare objects before they are displayed in one of SMG’s family of museums. Construction on the 26,000 sq m building, to house 340,000 objects, is due to start next year and be completed in 2020. The new St Regis Belgrade Hotel will occupy the first nine floors of the 40-storey Kula landmark building in the city’s waterfront development. This strategic location led HOK to develop a design that celebrates the joining of the old and the new, with a scheme that draws inspiration from rich heritage of the so-called White City. The hotel will accommodate 119 guest rooms, restaurants, bars, fitness centre, spa and meeting spaces. Expected completion is 2020. Online interiors marketplace eporta has launched its third annual interiors trend report, documenting buying trends through analysis of its search data from more than 10,000 interior trade buyers across 85 countries. The extensive report’s most notable findings are: the fastest rising colour is orange, followed by yellow and pink; dark wood is now more popular than light wood; and searches for velvet have increased fourfold. The report also details the most searched terms in the categories of materials, fabric, colour, furniture, country and brands. The full report can be found on the eporta website.